Migration is in full swing and birdwatching is almost at its peak as neo-tropical migrants are arriving and passing through middle TN. For daily birdwatching reports to your E-mail you may subscribe to TNBird@freelist.org. At your feeders you may be seeing the Rose-breasted Grosbeak and the Indigo Bunting. Keep an eye out for these beautiful birds because their presence at the feeders only lasts for a few weeks. Usually by mid-May they will have moved on. Indigo Buntings can be seen all summer long especially in fields and meadows, and in areas along the Harpeth River. The Harpeth River Greenway is an excellent place to see Indigo’s. There is access to the greenway from the back of the warner parks or from Reese Smith Jr. baseball fields. Both species are very interested in bird feeders and will go for a variety of feeds including black-oil sunflower, safflower, and millet. But this week we are going to profile the Pileated Woodpecker only because I captured some great video of one working an old rotting stump for food. The normally very shy woodpecker was so intent on extracting ants, beetles and larvae from this stump it did not seem to be concerned that I was close by. With the probable extinction of the Ivory-billed woodpecker the Pileated Woodpecker is now the largest member of the Picidae family in North America. This crow sized woodpecker, up to 19” in length, is an impressive bird known for its bright red crest. In fact, “Pileated” means “crested”. Males tend to be 10 to 15 percent heavier than females and can be distinguished from females by the red mustache stripes. Note the red mustache on this male in the video. On males the red crest extends from the bill to the nape of the neck while on females it is smaller. They are often heard and not seen in dense wooded areas. The call is loud, high-pitched and nasal, and is given as a single note or in a series. The Pileated Woodpecker’s main food source is insects and when available seasonal berries. One fall I witnessed a pair of Pileated’s strip every berry off a Dogwood tree in my yard. They are excellent excavators, as you can see in the video, and are important to other species of birds and animals for that reason. Other birds and animals eventually take up residence in the abandoned nest sites. Pileated woodpeckers excavate a new nest site every year and mate for life. 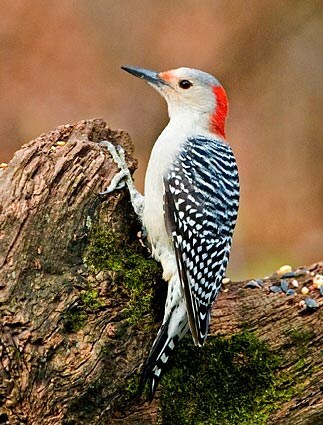 If you live in an area of dense woods you are likely to see these great birds but do not expect them to visit feeders. Although there are occasions for this bird to visit feeders it is uncommon. During the spring months while they are on nest is the most likely time to see them take advantage of suet or shelled peanuts. Get out there and enjoy some birdwatching this weekend. It will be perfect conditions to get out early and take a walk with the binoculars. The Red-bellied woodpecker has always been one of my favorite feeder birds. This handsome woodpecker measures around 9.25” in length with a wingspan of roughly 16”. 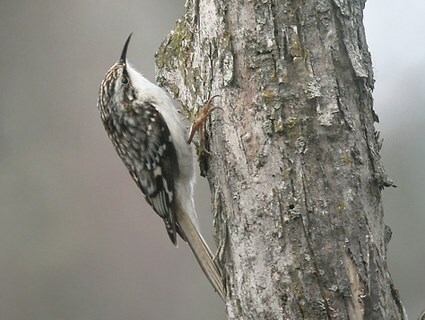 It is common in mature deciduous woods, and visits backyard feeders regularly. It has a uniformly barred back, which causes some to misidentify as a Ladder-backed woodpecker, brown under parts, and a white rump that is obvious in flight. The red on the male covers the crown (top of head) and nape of the neck, while the red on females, only the nape of the neck. Many people will ask why it’s called a Red-bellied woodpecker because they fail to see the red on the belly which is a faint round spot about the size of a quarter. If you get them at your feeders watch closely and you will see the red spot. The call is distinctive and very unlike the Downy and Hairy woodpeckers. Calls include sounds such as a churr, or chaw, and a kwir. Standing dead tree sections are a great way to attract Red-bellies in the nesting season. Starlings can be a threat to Red-bellied nest sites. “Red bellies” nest primarily in cavities in dead snags of trees, another good reason to leave some dead wood in the trees around the yard. In my yard I’ve had a Black Locust tree dying for years that I’ve left alone because a pair of Red-bellied woodpeckers choose it every year to excavate a new net-site. I’ve read in some books they will use a birdhouse but I’ve never witnessed this. Starlings tend to be a real threat to a Red-bellies nest-site, often sitting very close by while the woodpeckers work for weeks excavating and then harassing them until they give up, or the Starlings destroy eggs or babies. They will raise two to sometimes three broods here in the south. Male red-bellied on a fresh fruit feeder. Red-bellies love peanuts in or out of the shell. At feeders they readily accept sunflower and safflower seeds, raw peanuts and shelled roasted peanuts, suet, and even fruit. “Red-bellies” rarely back down to any bird at the feeders, even Blue jays tend to give them space. Don't forget all bird feeders (including peanut and suet feeders) are on sale through February 18th. AND NEXT WEEK, BLUEBIRDS. It’s that time. February is a great time to get Bluebird boxes out as they begin to pair off and begin looking at potential nest-sites. Over the next few weeks we will cover frequently asked questions about Bluebirds, like nest box location, competition from other birds, and best ways to offer live mealworms.